We did this activity as a silent activity as not all out clients speak English. We used poker chips as money. Most of our items were donated. I had talked to some of the participants before as to what they would like and several mentioned needlework kits even ones started. Our local Rescue Mission had several for a little bit of money and 2 were donated. Other big hits was were jars of sugar free candy and fleece lap blankets which were donated. The participants enjoyed it so much and can't wait to do it again. Keep the great ideas coming! Fun idea! I do auctions every so often with fake money that I found (clip art). I just printed the money on paper, cut them out and give them each the same amount of money. I do $15.00 each. I made a rule, though, that they can only raise the bit by either one or two dollars. That way they don't just automatically bid their full $15.00 right off the bat. It also makes the game last a little longer and gives some of the slower residents some time to think. 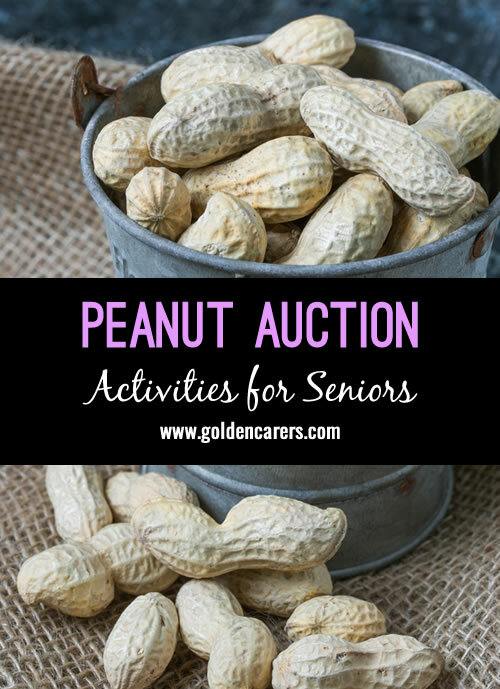 Held our first peanut auction today. We used small trinket gifts etc as the items for auction. The residents had a ball, so much laughter and competitiveness. Great activity that we will hold again. Thank you. This sounds like a lot of fun Joanne! Thanks for sharing! Golden Carers helps me professionally carry out my daily activities and keep my residents happy! I just love Golden Carers.